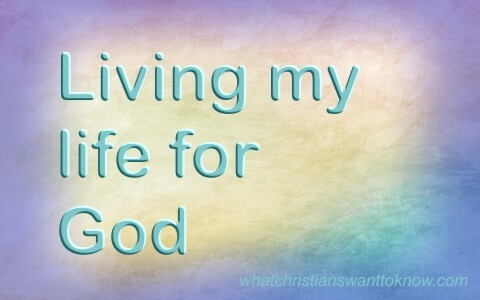 How Do I Turn My Life Over To God? How can we turn our life over to God? What does it look like to do this? What can we do to help us turn our life over to God? Jesus Himself submitted to the Father and to His will saying “For I have come down from heaven not to do my will but to do the will of him who sent me” (John 6:38). Even at the cross He prayed “Take this cup from me. Yet not what I will, but what you will” (Mark 14:36). Jesus was co-equal in power to God the Father but willingly submitted to His will since “being in very nature God, did not consider equality with God something to be grasped, but made himself nothing, taking the very nature of a servant, being made in human likeness. And being found in appearance as a man, he humbled himself and became obedient to death, even death on a cross” (Phil 2:6-8) and because of this willful submission, “God has highly exalted him and bestowed on him the name that is above every name, so that at the name of Jesus every knee should bow, in heaven and on earth and under the earth, and every tongue confess that Jesus Christ is Lord, to the glory of God the Father” (Phil 2:9-11). As you can read, this didn’t mean Jesus was inferior to the Father but only submitting to the Father. Submitting does not mean someone is less than someone else. Turning your life over to God means turning your own will over to Him and this means you have to put your own interests behind the interests of God. Paul wrote that “those who belong to Christ Jesus have crucified the flesh with its passions and desires” (Gal 5:24) for it was as if “our old self was crucified with him so that the body ruled by sin might be done away with, that we should no longer be slaves to sin” (Rom 6:6). Paul went so far as to say “I have been crucified with Christ and I no longer live, but Christ lives in me. The life I now live in the body, I live by faith in the Son of God, who loved me and gave himself for me” (Gal 2:20) and so if we “walk by the Spirit, and you will not gratify the desires of the flesh” (Gal 5:16) and we’ll be in submission to Christ as Paul said “through which the world has been crucified to me, and I to the world” (Gal 6:14). If we are truly submitting to God this means we are dying to ourselves. That is we are dying to our own desires, wants, and passions of the flesh and turning our lives over to God for Him to use for His purposes and for His glory for nothing else matters in this life than to do the will of God. What does this look like? Paul writes “For if you live according to the flesh you will die, but if by the Spirit you put to death the deeds of the body, you will live. For all who are led by the Spirit of God are sons of God” (Rom 8:13-14). For those who have been born again, they had to first put the old man or woman to death as Paul explains “Do you not know that all of us who have been baptized into Christ Jesus were baptized into his death? We were buried therefore with him by baptism into death, in order that, just as Christ was raised from the dead by the glory of the Father, we too might walk in newness of life” (Rom 6:3-4) and “if we have been united with him in a death like his, we shall certainly be united with him in a resurrection like his. We know that our old self was crucified with him in order that the body of sin might be brought to nothing, so that we would no longer be enslaved to sin” (Rom 6:5-6). We are set free by the death of the old man or woman because the “one who has died has been set free from sin” (Rom 6:7) and “if we have died with Christ, we believe that we will also live with him” (Rom 6:8). That is why “you also must consider yourselves dead to sin and alive to God in Christ Jesus” (Rom 6:11). Jesus told those who would follow Him “If anyone would come after me, let him deny himself and take up his cross and follow me” (Matt 16:24) because “Whoever does not take up their cross and follow me is not worthy of me” (Matt 10:38). Not only are they not worthy of Christ “whoever does not carry their cross and follow me cannot be my disciple” (Luke 14:27). When Jesus chose the disciples He simply told them “Follow me, and I will make you become fishers of men” (Mark 1:17). Did Jesus ask them what they thought or if they wanted to do this or did the disciples have to stop and think about it? No, “At once they left their nets and followed him” (Mark 1:18). There is no sign of hesitation on their part. There is no indication that they stopped to talk it over…they simply left their nets and followed Him. It sounds simple enough but by their leaving their nets, they were leaving all that they had ever known. They left everything that was familiar to them; their job security, their earning a living, their family, their friends…everything! I don’t think we give them enough credit because they did just what Abraham did in a sense as Abraham left all to go to a place he’d never seen, called by a God that he’d never known. How about you; how about me? Will we turn our life over to God? If we will, this means that we must be willing to step out in faith and go into areas that are unfamiliar territory to us. If we truly are to turn our life over to God, it means that we will put God’s will over our own, we will follow Christ wherever He leads us; we will die to our own self, meaning our passions, desires, and wants; we will be crucifying the flesh which is our natural, earthly desires, and we will take up our cross and put to death the old man or woman because we’ve become new creations in Christ (2 Cor 5:17) and all things will be new, like new desires to obey God, new passions for the things of God, and a new will that matches closely to that of the Father. Easy to say but so very hard to do but through Christ, we can do all things (Phil 4:13). Related reading: What Does it Mean to Take Up Your Cross Daily? Thank you for another great post Jack! For me it has been a process of slowly surrendering more and more of my life to Him. I wanted to be able to completely turn my life over all at once, but I was unable to. I prayed to do His will, not mine (and continue in those prayers). From my experience, I say give up as much as you can, and then see what happens. You may find that you are able to turn over more and more as time goes by. Especially if that is your true desire. It is not easy, but remember you are looking at eternal rewards, beyond what you can imagine. Amen brother…knowing you as I do now, I know you are closer to living this out than any other single person I know. You have sacrificed so much but you are right my beloved brother…we can’t even imagine what awaits us. You have given so much but your true riches await you in the kingdom. Can’t wait to meet you in person my new Jonathan-to-David friend. I met a woman in Florida who gave away all of her possessions (including her home), career, and her money. Apparently it was a fairly sizable amount of money, and she laid it at the Elders of her church’s feet. She was in an intensive year of living for Christ when we met. She spent her days praying and studying the Holy Bible. She is actually the one that taught me how to live in my car! She fasted so much that she was very thin. She said the Lord eventually placed it on her heart to stop fasting so much! She is an amazing person to meet, and we had great fellowship and prayer together before we went our separate ways. She was planning to live a year like that, and then go back to her worldly life. I’m not so sure that after a year she will go back to living how she used to. She definitely submits herself to God’s will, and it should be interesting to see where He leads her. I was thinking about this blog post as I slept in my car last night. If we have comfortable lives on earth, what causes us to set our hearts and minds on heaven? If you are already comfortable, why bother yourself with thinking about a heavenly future? It may be that discomfort is the best way to stay focused on the eternal. I don’t view myself as extraordinary in any way. I try to live a simple life, and try to focus on loving God, and loving the people He places in my path. I see your life being lived out in ways that are extraordinary to me brother. Few are willing to go as far as you have. If I was single, it might be easier but with my last one in the nest (off to college this fall) and my wife living at home being sick, it is hard for me to do much in my own interests when I must consider her. Please keep me updated when you hear about this woman who is also losing her life to live it for Christ, again, another extraordinary in the very ordinary for most Christians. I believe that all Christians have opportunities to use their lives to build and/or strengthen God’s Kingdom. A single person without a family can be used differently than a married person with children. God can use each of us, if we allow ourselves to be used. Preaching the truth, both online and off, is a great contribution! I will let you know if I hear from sister Brenda! Next post: What Does The Bible Say About Taking Care Of Nature?